I backed the Pen Addict Kickstarter this past spring and received a Nock Co Hightower in dark green and yellow. It was fabulous, but after a few days of testing it out, it simply didn’t suit my needs. 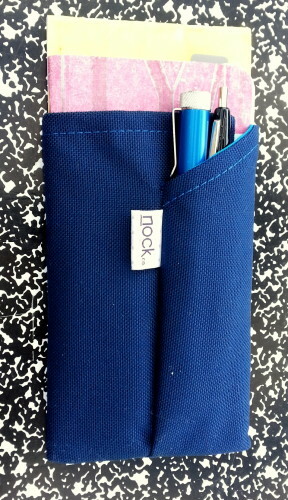 I sold it and bought myself a Fodderstack XL, which is basically a cordura nylon sheath for a pocket notebook and a pen or two. I bought mine in the midnight and blue jay color way, which is a deep navy blue outside and bright blue inside. The stitching is slightly lighter than the exterior canvas, which I quite like. Looks wise, this is a pretty simple concept, in line with the DDC Stuff Sheath, but nylon and vegan for people who care about that sort of thing. I’m not vegan but I was looking for a lighter weight alternative for my summer notebook carry. My One Star Leather goods cover is heavy and seems to cause excessive sweating in my rear pocket. The Fodderstack XL (FXL hereafter) fit my needs better than the Hightower. 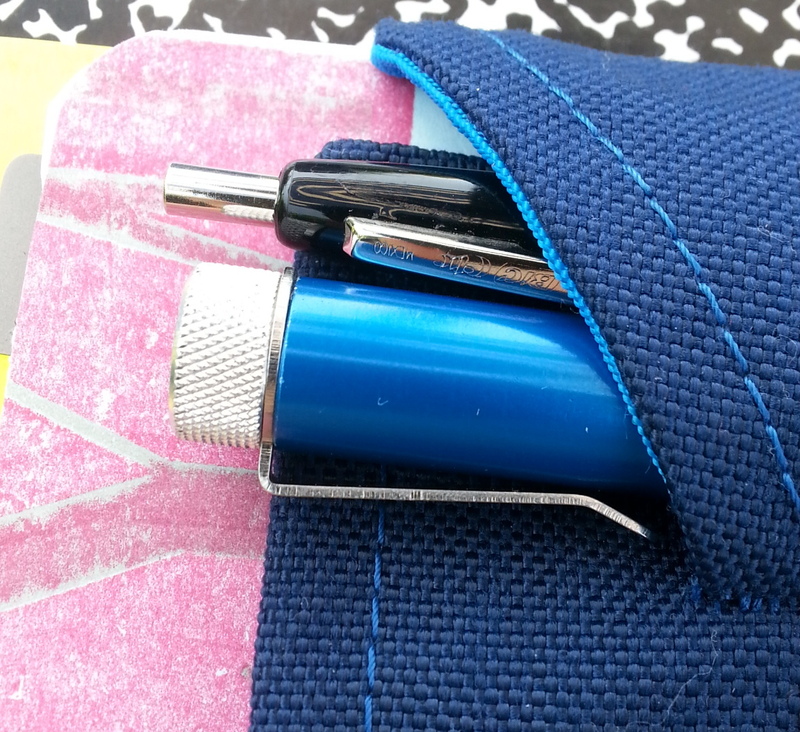 It fits into my back pocket, carries up to 2 notebooks and my Metal Shop CT Twist bullet pencil, and either a pen or other writing tool. Lately I’ve had a Field Notes BIC Clic in there. Currently, I’m using a Field Notes and a Nock Co Yellow flap notebook. Now that I’ve been using the FXL steadily for over a month, I can’t imagine my carry without it. In fact, I’m not sure I’ll go back to the leather cover at all. The FXL is smaller, lighter, and simply works for me. Now that I’ve professed my love for the FXL, let me tell you a couple of issues that my FXL exhibits. At least one of which is nit-picky and the others… Less so. First, my tag is stitched on slightly crooked. This annoys me but does not alter the functionality of the FXL. The bottom edges are not heat sealed. This meant that until I turned my FXL inside out and singed the edges with a lighter, little frayed bits of nylon kept finding their way out of the bottom. * This greatly annoyed me, it also lowers the longevity of the piece. If the bottom continued to fray, eventually it would tear out. *GNASHES TEETH* My final issue is that some of the stitching was both loose and poorly done. I used my sewing skills to pull a loose thread through, tie it off and then heat seal it. In fact I went over every end stitch and sealed it with a flame. Had I not done this my FXL may not have made it the month. I’m looking at these issues as aberrations because the Hightower did not have any of these flaws. Especially, not the stitching flaws. 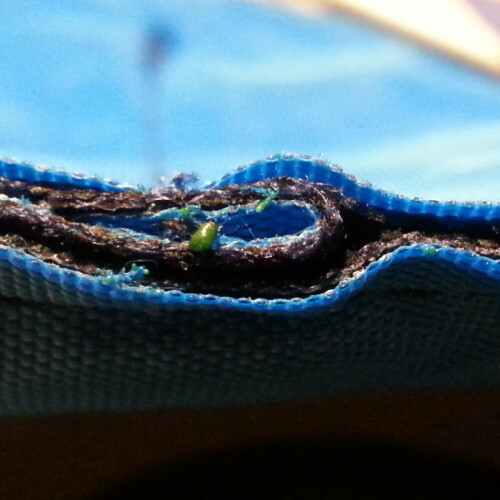 I think the basic design of the FXL leave the bottom seam open to fraying, and a wonderful solution would be to heat seal the edge after sewing the bottom. That would keep the bulk down, but stop the fray. 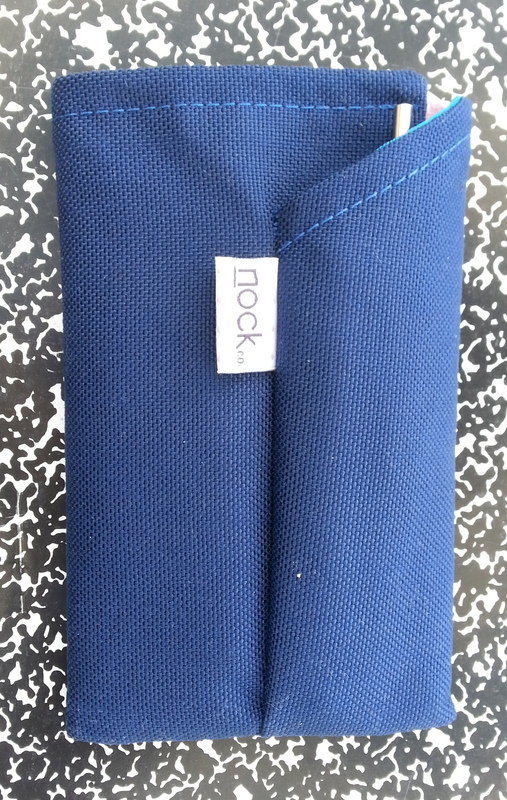 Perhaps Nock Co should also look at upping their quality control. The loose stitching was apparent the moment I put a pencil into the case. Anyway, the FXL is part of my daily carry, and I think if you are trying to simplify yours, it can be that cover. *Don’t try this at home even if you are brave. I take no responsibility if you burn yourself, your FXL or house down. This is a simply fix with a simple lighter- flip the FXL inside out, light up a lighter, and run it along the frayed edge, using care not to allow the flame to lick too close, you just want to barely singe the frayed nylon, not light your house on fire. This entry was posted in Review and tagged EDC, fodderstack, fodderstack xl, nock, nockco on 20150714 by leslie.